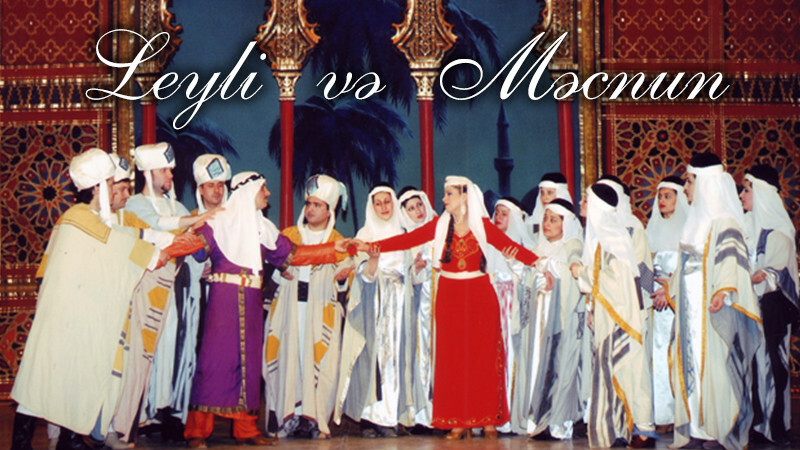 Leyli and Majnun in Azerbaijan State Academic Opera and Ballet Theatre buy tickets online. Delivery of tickets for the event Leyli and Majnun. Madrasah yard. Young Geis is in love with beautiful Leyli. They conceal their love and meet secretlu but tfieir schoolmates notice them. The girls reproach the lovers and take Leyli way. Affested bu their son’s sorrow, Geis’s parents try to console him. They promise to ask Leyli’s hand in marriage. Leyli s house. The rumours about the love of the young people that have been sprea­ding from mouth to mouth have reached the girl’s mother. She reproaches her daughter and forbids her to attend the madrasah. The friends of Leyli’s father do not advise him to give her daughter to a man who is reputed to be “Mejnun” (one possessed). Geis’s father who comes to ask Leyli’c hand in marriage for his son refused. Geis, - Meinun, is heavy at heart. Ne cannot imagine his without Leyli and is readu to endure all hardships and afflictions in the name of his love. His sorrow is boundless. Bitter days of separation have crept into the life of the lovers. A rich man ibn-Salam asks for Leyli’s hand in manage and is accepted. The news is brought to Leyli, she is in despair. Wedding feast in Ibn-Salam’s house. Mejnun is flinging around the house. The cere- monu is over, the guests congratulate the newly weds and break up. Mejnun penetrates in­to the house. He hurls bitter reproaches at Leyli. The people who were pursuing him lead him away. Having lost his last hope, Mejnun retires into the desert. Desert. Mejnun lives here dreaming of Leyli. He is haunted bu her beautiful vision, in vain does his father ask him to return home. Arabs who are passing bu take an interest in the fate of the young exile. Theiq chieftain Nofel is agitated “bu the youth’s sad storu. He promises to oring Leyli back bu force of arms and warns Leyli’s father about this, sugges­ting that they should reach a peaceful agreement. Leyli’c father turns down Morel’s pro­position. A severe battle breaks out. Leyli’s father begs for mercu and tells them that Leyli has alreadu been married. Nofel orders to stop the battle. The separation from her lover has shattered Leyli and brokendown her strength. She is on her death-bed. ibn-Salam complains of his unrequieted love. Leyli makes a confession - she cannot love anyone except Mejnun. ibn-Salam leaves her. Enters Mejnun. He sings about hisbitter fate, about his suffering. He calls his beloved. Leyli cannot survive the the collapes of her hopes. She dies. Having learned about Leyli’s death, Mejnun asks his fri­end to lead him to the grave of his love. Embracing the grave, unfortunate Mejnun bewa- lis the loss of Leyli. He dies remaining loyal fo his bright invicible love weich is stronger than death.